Definition at line 415 of file llmenugl.h. Definition at line 547 of file llmenugl.h. Definition at line 549 of file llmenugl.h. Definition at line 1823 of file llmenugl.cpp. References FALSE, mFadeTimer, setCanTearOff(), LLUICtrl::setTabStop(), LLFrameTimer::stop(), and TRUE. Referenced by createSpilloverBranch(), and fromXML(). Definition at line 1848 of file llmenugl.cpp. Definition at line 1874 of file llmenugl.cpp. Definition at line 2655 of file llmenugl.cpp. References LLView::addChild(), arrange(), mItems, and TRUE. Referenced by LLPieMenu::append(), LLMenuBarGL::appendMenu(), appendMenu(), LLMenuBarGL::appendSeparator(), appendSeparator(), arrange(), LLVOAvatar::buildCharacter(), LLObjectBridge::buildContextMenu(), init_client_menu(), init_debug_avatar_menu(), init_debug_baked_texture_menu(), init_debug_rendering_menu(), init_debug_ui_menu(), init_debug_world_menu(), init_debug_xui_menu(), init_landmark_menu(), init_server_menu(), LLNetMap::LLNetMap(), and parseChildXML(). Definition at line 2671 of file llmenugl.cpp. References append(), getJumpKey(), getLabel(), LLView::getName(), llendl, llerrs, mBackgroundColor, NULL, setBackgroundColor(), LLMenuItemGL::setJumpKey(), and TRUE. Referenced by init_client_menu(), init_debug_avatar_menu(), init_debug_rendering_menu(), init_server_menu(), and parseChildXML(). Reimplemented in LLPieMenu, and LLMenuBarGL. Definition at line 2664 of file llmenugl.cpp. Referenced by LLVOAvatar::buildCharacter(), init_client_menu(), init_debug_rendering_menu(), init_debug_ui_menu(), init_landmark_menu(), init_server_menu(), LLNetMap::LLNetMap(), and parseChildXML(). Definition at line 2338 of file llmenugl.cpp. References LLView::addChild(), append(), cleanupSpilloverBranch(), createSpilloverBranch(), LLRectBase< Type >::getHeight(), LLMenuItemGL::getNominalHeight(), LLMenuItemGL::getNominalWidth(), getTornOff(), LLRectBase< Type >::getWidth(), LLFontGL::getWidth(), height, llmax(), llmin(), llround(), LLRectBase< Type >::mBottom, MENU_ITEM_PADDING, mHorizontalLayout, mItems, mKeepFixedSize, LLRectBase< Type >::mLeft, LLView::mRect, LLRectBase< Type >::mRight, mSpilloverBranch, mSpilloverMenu, LLRectBase< Type >::mTop, PLAIN_PAD_PIXELS, LLView::removeChild(), LLView::reshape(), S32, S32_MAX, sMenuContainer, LLFontGL::sSansSerif, and width. Referenced by append(), LLMenuItemTearOffGL::doIt(), LLTearOffMenu::draw(), LLViewerTextEditor::handleRightMouseDown(), LLFolderView::handleRightMouseDown(), LLMenuItemBranchDownGL::openMenu(), LLMenuItemBranchGL::openMenu(), setCanTearOff(), and setLeftAndBottom(). Definition at line 2927 of file llmenugl.cpp. 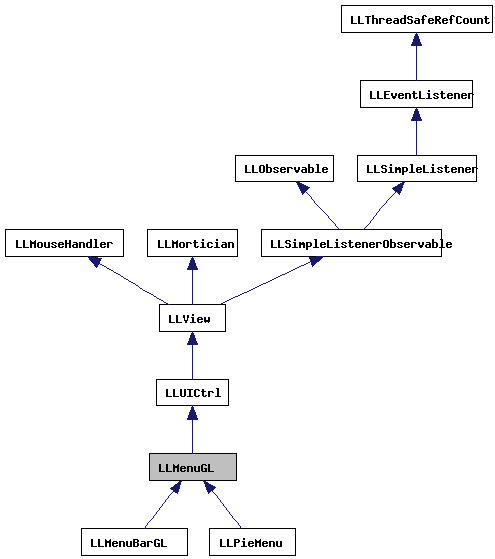 Referenced by LLWornItemFetchedObserver::done(), and LLNetMap::handleRightMouseDown(). Definition at line 2484 of file llmenugl.cpp. References LLView::addChild(), cleanupSpilloverBranch(), getItem(), getItemCount(), LLView::getParent(), mItems, mSpilloverBranch, mSpilloverMenu, NULL, and LLView::removeChild(). Referenced by arrange(), cleanupSpilloverBranch(), and empty(). Definition at line 3146 of file llmenugl.cpp. References FALSE, LLView::getChildList(), and TRUE. Referenced by LLMenuBarGL::checkMenuTrigger(), LLMenuBarGL::draw(), LLMenuBarGL::handleAcceleratorKey(), LLMenuItemBranchGL::handleKeyHere(), LLViewerMenuHolderGL::hideMenus(), LLTearOffMenu::onClose(), LLTearOffMenu::onFocusLost(), LLMenuItemBranchDownGL::setHighlight(), LLMenuItemBranchGL::setHighlight(), LLMenuItemGL::setHighlight(), setVisible(), and LLTearOffMenu::translate(). Definition at line 2515 of file llmenugl.cpp. References FALSE, i, LLStringOps::isDigit(), LLStringOps::isUpper(), KEY_NONE, mItems, mJumpKeys, S32, LLStringBase< char >::toUpper(), and TRUE. Referenced by LLMenuBarGL::fromXML(), fromXML(), init_client_menu(), init_debug_avatar_menu(), init_debug_baked_texture_menu(), init_debug_rendering_menu(), init_debug_ui_menu(), init_debug_world_menu(), init_debug_xui_menu(), init_menus(), and init_server_menu(). Definition at line 2465 of file llmenugl.cpp. References FALSE, LLFontGL::ITALIC, LLMenuGL(), mBackgroundColor, mParentFloaterHandle, mSpilloverBranch, mSpilloverMenu, setBackgroundColor(), setCanTearOff(), LLMenuItemGL::setFontStyle(), sMenuContainer, and updateParent(). Definition at line 3079 of file llmenugl.cpp. References LLView::draw(), LLControlGroup::getColor(), LLRectBase< Type >::getHeight(), LLControlGroup::getS32(), LLRectBase< Type >::getWidth(), gl_drop_shadow(), gl_rect_2d(), mBackgroundColor, mBgVisible, mDropShadowed, LLView::mRect, mTornOff, LLUI::sColorsGroup, and LLUI::sConfigGroup. Definition at line 3097 of file llmenugl.cpp. References LLRectBase< Type >::getHeight(), LLView::getRect(), LLRectBase< Type >::getWidth(), gl_rect_2d(), glColor4fv, and LLColor4::mV. Definition at line 2612 of file llmenugl.cpp. References cleanupSpilloverBranch(), LLView::deleteAllChildren(), and mItems. Definition at line 2251 of file llmenugl.cpp. References createJumpKeys(), FALSE, LLUICtrlFactory::getAttributeColor(), KEY_NONE, LLMenuGL(), LLPointer< Type >::notNull(), parseChildXML(), S32, setBackgroundColor(), setBackgroundVisible(), setCanTearOff(), setDropShadowed(), and setJumpKey(). Referenced by LLUICtrlFactory::buildMenu(), LLMenuBarGL::fromXML(), and parseChildXML(). Definition at line 2331 of file llmenugl.cpp. Definition at line 525 of file llmenugl.h. Definition at line 3127 of file llmenugl.cpp. References LLView::getChildByName(), LLView::getWidgetType(), llendl, llwarns, LLView::mName, NULL, WIDGET_TYPE_MENU, WIDGET_TYPE_MENU_ITEM_BRANCH, and WIDGET_TYPE_PIE_MENU. Referenced by LLObjectBridge::buildContextMenu(), and init_menus(). Definition at line 2774 of file llmenugl.cpp. Referenced by LLMenuBarGL::checkMenuTrigger(), LLMenuItemBranchGL::doIt(), LLMenuBarGL::draw(), LLMenuBarGL::handleAcceleratorKey(), LLMenuBarGL::handleHover(), LLViewerWindow::handleKey(), LLTearOffMenu::handleKey(), LLMenuItemBranchGL::handleKeyHere(), LLMenuItemBranchGL::isActive(), isOpen(), LLMenuBarGL::jumpKeysActive(), jumpKeysActive(), and LLTearOffMenu::onFocusReceived(). Definition at line 2757 of file llmenugl.cpp. References mItems, NULL, and S32. Referenced by LLMenuItemBranchGL::addToAcceleratorList(), LLPieMenuBranch::buildDrawLabel(), and cleanupSpilloverBranch(). Definition at line 2752 of file llmenugl.cpp. Definition at line 527 of file llmenugl.h. Definition at line 531 of file llmenugl.h. Referenced by LLMenuItemBranchGL::doIt(), LLMenuBarGL::draw(), LLMenuItemBranchDownGL::draw(), LLMenuItemGL::draw(), LLMenuBarGL::handleHover(), LLViewerWindow::handleKey(), LLMenuItemBranchDownGL::handleKeyHere(), and LLMenuBarGL::jumpKeysActive(). Definition at line 446 of file llmenugl.h. Referenced by LLMenuBarGL::appendMenu(), LLPieMenu::appendMenu(), and appendMenu(). Definition at line 520 of file llmenugl.h. Referenced by jumpKeysActive(), and LLTearOffMenu::onFocusReceived(). Definition at line 523 of file llmenugl.h. Referenced by arrange(), LLMenuItemBranchDownGL::draw(), LLMenuItemBranchGL::draw(), LLMenuItemBranchGL::handleKeyHere(), highlightNextItem(), highlightPrevItem(), isOpen(), jumpKeysActive(), LLMenuItemBranchGL::onVisibilityChange(), LLMenuItemBranchDownGL::openMenu(), LLMenuItemBranchGL::openMenu(), LLMenuItemBranchDownGL::setHighlight(), and LLMenuItemBranchGL::setHighlight(). Definition at line 428 of file llmenugl.h. Definition at line 427 of file llmenugl.h. Definition at line 1902 of file llmenugl.cpp. References LLMenuItemGL::getXML(), LLView::getXML(), mBackgroundColor, mBgVisible, mDropShadowed, mItems, mTearOffItem, LLColor4::mV, NULL, and TRUE. Referenced by LLMenuBarGL::getXML(), and LLMenuItemBranchGL::getXML(). Definition at line 2981 of file llmenugl.cpp. References FALSE, LLView::mEnabled, mItems, and TRUE. Referenced by LLMenuBarGL::handleAcceleratorKey(), LLMenuItemBranchDownGL::handleAcceleratorKey(), and LLMenuItemBranchGL::handleAcceleratorKey(). Definition at line 3012 of file llmenugl.cpp. References f, FALSE, LLView::getChildList(), LLView::getWindow(), lerp(), llabs(), llclamp(), llround(), MAX_MOUSE_SLOPE_SUB_MENU, mHasSelection, mLastMouseX, mLastMouseY, mMouseVelX, mMouseVelY, LLVector2::normVec(), S32, LLWindow::setCursor(), setKeyboardMode(), TRUE, and UI_CURSOR_ARROW. Definition at line 2630 of file llmenugl.cpp. References mJumpKeys, setKeyboardMode(), and TRUE. Definition at line 2951 of file llmenugl.cpp. References FALSE, LLView::getChildList(), LLView::getName(), LLView::handleKeyHere(), llendl, llinfos, LLView::mEnabled, LLView::sDebugKeys, and TRUE. Referenced by LLViewerWindow::handleKey(), LLTearOffMenu::handleKey(), and LLMenuItemBranchGL::handleKey(). Definition at line 3003 of file llmenugl.cpp. References FALSE, handleJumpKey(), and jumpKeysActive(). Definition at line 2787 of file llmenugl.cpp. References FALSE, LLView::getParent(), getTornOff(), mItems, mTearOffItem, NULL, SEPARATOR_NAME, LLUICtrl::setFocus(), and TRUE. Referenced by LLMenuBarGL::checkMenuTrigger(), LLMenuItemBranchGL::doIt(), LLMenuItemTearOffGL::doIt(), LLMenuBarGL::handleAcceleratorKey(), LLMenuItemSeparatorGL::handleHover(), LLTearOffMenu::handleKey(), LLMenuItemBranchDownGL::handleKeyHere(), LLMenuItemBranchGL::handleKeyHere(), LLMenuItemGL::handleKeyHere(), LLTearOffMenu::LLTearOffMenu(), LLTearOffMenu::onFocusReceived(), and LLMenuItemBranchGL::openMenu(). Definition at line 2865 of file llmenugl.cpp. References LLView::getParent(), getTornOff(), mItems, NULL, SEPARATOR_NAME, LLUICtrl::setFocus(), and TRUE. Referenced by LLMenuItemSeparatorGL::handleHover(), LLTearOffMenu::handleKey(), LLMenuItemBranchDownGL::handleKeyHere(), and LLMenuItemGL::handleKeyHere(). Definition at line 2229 of file llmenugl.cpp. References getHighlightedItem(), LLView::getParent(), getTornOff(), LLView::getVisible(), LLMenuItemGL::isOpen(), and TRUE. Referenced by LLMenuBarGL::handleHover(), LLFolderView::handleKeyHere(), and LLMenuItemBranchGL::isOpen(). Definition at line 2208 of file llmenugl.cpp. References LLView::getEnabled(), getHighlightedItem(), LLView::getParent(), getParentMenuItem(), getTornOff(), LLView::getVisible(), LLUICtrl::hasFocus(), and LLMenuItemGL::isActive(). Referenced by LLMenuItemBranchDownGL::draw(), LLMenuItemGL::draw(), handleUnicodeCharHere(), and LLMenuBarGL::jumpKeysActive(). Definition at line 1935 of file llmenugl.cpp. References LLView::addBoolControl(), LLObservable::addListener(), append(), appendMenu(), appendSeparator(), FALSE, LLView::findControl(), fromXML(), LLView::getListenerByName(), KEY_NONE, LLKeyboard::keyFromString(), LL_MENU_GL_TAG, LL_MENU_ITEM_CALL_GL_TAG, LL_MENU_ITEM_CHECK_GL_TAG, LL_MENU_ITEM_SEPARATOR_GL_TAG, llformat(), mask, MASK_ALT, MASK_CONTROL, MASK_MAC_CONTROL, MASK_SHIFT, LLPointer< Type >::notNull(), NULL, S32, LLMenuItemCallGL::setEnabledControl(), LLMenuItemGL::setLabel(), LLMenuItemCallGL::setVisibleControl(), sMenuContainer, and type. Referenced by fromXML(), and LLPieMenu::initXML(). Definition at line 2326 of file llmenugl.cpp. Referenced by appendMenu(), createSpilloverBranch(), LLMenuBarGL::fromXML(), fromXML(), init_menus(), LLFolderView::LLFolderView(), LLViewerTextEditor::LLViewerTextEditor(), and set_god_level(). Definition at line 452 of file llmenugl.h. Referenced by LLTearOffMenu::draw(), LLMenuBarGL::fromXML(), fromXML(), and LLTearOffMenu::onClose(). Definition at line 1882 of file llmenugl.cpp. References LLView::addChildAtEnd(), arrange(), mItems, mTearOffItem, NULL, and LLView::removeChild(). Referenced by createSpilloverBranch(), fromXML(), LLMenuBarGL::LLMenuBarGL(), LLMenuGL(), LLNetMap::LLNetMap(), and LLPieMenu::LLPieMenu(). Definition at line 2321 of file llmenugl.cpp. Definition at line 2742 of file llmenugl.cpp. Referenced by LLMenuBarGL::fromXML(), fromXML(), LLTearOffMenu::LLTearOffMenu(), and LLTearOffMenu::onClose(). Definition at line 2691 of file llmenugl.cpp. Definition at line 2703 of file llmenugl.cpp. Referenced by LLSelectMgr::processObjectProperties(), and show_debug_menus(). Definition at line 2730 of file llmenugl.cpp. References LLMenuItemGL::buildDrawLabel(), LLView::getVisible(), and LLMenuHolderGL::setActivatedItem(). Referenced by LLMenuItemToggleGL::doIt(), and LLMenuItemCallGL::doIt(). Definition at line 2717 of file llmenugl.cpp. Definition at line 528 of file llmenugl.h. Definition at line 530 of file llmenugl.h. Referenced by LLMenuBarGL::checkMenuTrigger(), LLMenuBarGL::handleAcceleratorKey(), LLMenuBarGL::handleHover(), handleHover(), LLMenuBarGL::handleJumpKey(), handleJumpKey(), LLMenuItemBranchDownGL::handleKeyHere(), LLMenuItemBranchGL::handleKeyHere(), LLMenuItemGL::handleKeyHere(), LLMenuItemBranchDownGL::handleMouseDown(), LLMenuItemGL::handleMouseDown(), LLMenuItemBranchGL::handleMouseUp(), LLMenuItemGL::handleMouseUp(), and LLMenuHolderGL::hideMenus(). Definition at line 447 of file llmenugl.h. Definition at line 2623 of file llmenugl.cpp. References arrange(), LLRectBase< Type >::mBottom, LLRectBase< Type >::mLeft, and LLView::mRect. Definition at line 519 of file llmenugl.h. Referenced by LLMenuItemBranchGL::LLMenuItemBranchGL(), and LLPieMenuBranch::LLPieMenuBranch(). Definition at line 2747 of file llmenugl.cpp. Referenced by LLTearOffMenu::LLTearOffMenu(), and LLTearOffMenu::onClose(). Definition at line 3104 of file llmenugl.cpp. References clearHoverItem(), FALSE, LLView::getVisible(), mFadeTimer, mHasSelection, mLastMouseX, mLastMouseY, LLView::setVisible(), LLFrameTimer::start(), and LLFrameTimer::stop(). Referenced by LLAgent::endAnimationUpdateUI(), LLViewerTextEditor::handleRightMouseDown(), LLFolderView::handleRightMouseDown(), init_menus(), LLFolderView::LLFolderView(), LLMenuItemBranchGL::LLMenuItemBranchGL(), LLNetMap::LLNetMap(), LLPieMenu::LLPieMenu(), LLTearOffMenu::LLTearOffMenu(), LLTearOffMenu::onClose(), LLMenuItemBranchGL::onVisibilityChange(), LLMenuItemBranchDownGL::openMenu(), LLMenuItemBranchGL::openMenu(), LLMenuItemBranchDownGL::setHighlight(), LLMenuItemBranchGL::setHighlight(), LLViewerWindow::setNormalControlsVisible(), and showPopup(). Definition at line 3167 of file llmenugl.cpp. References bottom, LLRectBase< Type >::getHeight(), LLMenuHolderGL::getMenuRect(), LLView::getParent(), LLView::getRect(), LLRectBase< Type >::getWidth(), HPAD, left, LLView::localPointToOtherView(), LLRectBase< Type >::mBottom, LLRectBase< Type >::mLeft, LLRectBase< Type >::mRight, S32, LLRectBase< Type >::setLeftTopAndSize(), LLView::setRect(), setVisible(), sMenuContainer, top, LLView::translate(), and TRUE. Referenced by LLViewerTextEditor::handleRightMouseDown(), LLNetMap::handleRightMouseDown(), and LLFolderView::handleRightMouseDown(). Definition at line 2936 of file llmenugl.cpp. References LLView::addChild(), LLView::getParent(), mItems, and LLView::removeChild(). Referenced by createSpilloverBranch(), LLMenuBarGL::getXML(), LLViewerTextEditor::handleRightMouseDown(), LLNetMap::handleRightMouseDown(), LLFolderView::handleRightMouseDown(), init_menus(), and LLMenuItemBranchGL::updateBranchParent(). Definition at line 545 of file llmenugl.h. Referenced by appendMenu(), createSpilloverBranch(), draw(), getBackgroundColor(), getXML(), and setBackgroundColor(). Definition at line 546 of file llmenugl.h. Definition at line 553 of file llmenugl.h. Referenced by draw(), getXML(), and setDropShadowed(). Definition at line 557 of file llmenugl.h. Referenced by LLMenuGL(), and setVisible(). Definition at line 556 of file llmenugl.h. 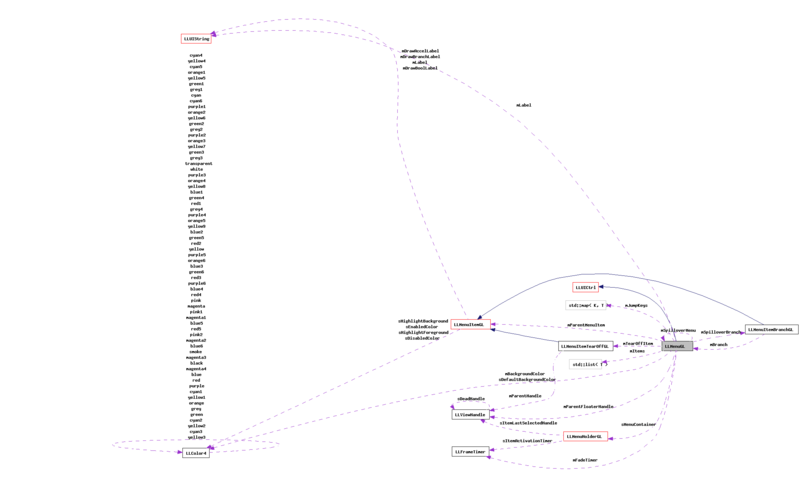 Referenced by handleHover(), and setVisible(). Definition at line 554 of file llmenugl.h. Referenced by arrange(), and LLMenuBarGL::LLMenuBarGL(). Definition at line 548 of file llmenugl.h. Referenced by append(), LLMenuBarGL::arrange(), LLPieMenu::arrange(), arrange(), buildDrawLabels(), cleanupSpilloverBranch(), createJumpKeys(), LLPieMenu::draw(), LLPieMenu::drawBackground(), empty(), getHighlightedItem(), getItem(), getItemCount(), LLMenuBarGL::getRightmostMenuEdge(), LLMenuBarGL::getXML(), getXML(), handleAcceleratorKey(), highlightNextItem(), highlightPrevItem(), LLPieMenu::pieItemFromXY(), setCanTearOff(), setEnabledSubMenus(), setItemEnabled(), setItemVisible(), and updateParent(). Definition at line 567 of file llmenugl.h. Referenced by getJumpKey(), and setJumpKey(). Definition at line 550 of file llmenugl.h. Referenced by createJumpKeys(), LLMenuBarGL::handleJumpKey(), handleJumpKey(), and ~LLMenuGL(). Definition at line 555 of file llmenugl.h. Definition at line 552 of file llmenugl.h. Definition at line 558 of file llmenugl.h. Referenced by LLMenuBarGL::handleHover(), handleHover(), and setVisible(). Definition at line 559 of file llmenugl.h. Definition at line 560 of file llmenugl.h. Referenced by LLMenuBarGL::handleHover(), and handleHover(). Definition at line 561 of file llmenugl.h. Definition at line 566 of file llmenugl.h. Definition at line 551 of file llmenugl.h. Referenced by getParentMenuItem(), and setParentMenuItem(). Definition at line 564 of file llmenugl.h. Referenced by arrange(), cleanupSpilloverBranch(), createSpilloverBranch(), and ~LLMenuGL(). Definition at line 565 of file llmenugl.h. Referenced by arrange(), cleanupSpilloverBranch(), and createSpilloverBranch(). Definition at line 563 of file llmenugl.h. Referenced by getCanTearOff(), getXML(), highlightNextItem(), and setCanTearOff(). Definition at line 562 of file llmenugl.h. Referenced by draw(), getTornOff(), and setTornOff(). Definition at line 542 of file llmenugl.h. Definition at line 543 of file llmenugl.h. Referenced by getKeyboardMode(), and setKeyboardMode(). Definition at line 535 of file llmenugl.h. Referenced by arrange(), createSpilloverBranch(), LLMenuItemGL::doIt(), LLMenuBarGL::fromXML(), LLFolderView::handleKeyHere(), LLPieMenu::handleMouseUp(), LLViewerTextEditor::handleRightMouseDown(), LLNetMap::handleRightMouseDown(), LLFolderView::handleRightMouseDown(), LLPieMenu::handleRightMouseUp(), init_menus(), LLMenuItemBranchGL::openMenu(), parseChildXML(), LLPieMenu::show(), and showPopup().